The first step to planning your or your child's baptism is to come to church on a Sunday and meet the interim Rector who will then arrange to meet with you for preparation. You will also be asked to fill in a request for baptism. Baptisms ordinarily take place on major feast days. On baptismal Sundays, we offer baptism during any of our regularly scheduled worship services, so that individuals or families may choose the service they attend most often. 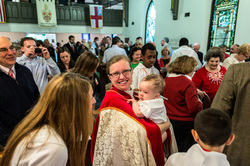 Consistent with the ancient tradition, it is required that every baptismal candidate have one or more godparents (for children) or a sponsor (for adults). Godparents and sponsors are typically present at the time of the baptism and serve as a Christian friend and mentor throughout life. Godparents and sponsors must ordinarily be baptized Christians. We additionally recommend that you select someone who is active in their faith community, and with whom you can anticipate a long-term relationship. One to four godparents or sponsors per candidate is appropriate.